A family business advisor sits with a founder and his two daughters in a conference room in Chicago, helping the family with an intense discussion they are having about the future of their family-owned brewery. The elder daughter works in the business. Neither daughter has shares in the family company. All three family members say they want what is best for the business and what is also fair to the three of them. But, for all of their agreement on principle, this discussion about future leadership, ownership and inheritance is getting testy and personal. The advisor picks up a marker, goes to a flip chart, and begins to draw. The circles he inscribes are a little wobbly, but that doesn’t matter. He labels the circles of the Venn diagram: Family, Ownership, and Business. He places each of the three family members in their appropriate sector of the diagram, and next to each of their names lists their interests and concerns. The diagram helps to clarify the roles and perspectives, and issues to be resolved. What the advisor has drawn is the Three-Circle Model of the Family Business System, the fundamental framework in the family business field, created by Renato Tagiuri and John Davis at Harvard Business School (HBS) in 1978. Forty years ago, Tagiuri and Davis were looking for a framework to categorize the issues, interests and concerns they were hearing from Tagiuri’s executive students who led family companies. In 1978, Davis was a first-year doctoral student and Tagiuri, a senior professor of organizational behavior. Davis had a strong interest in family psychology as well as in business organizations. Tagiuri was a new faculty member in the Owner President Management (OPM) executive program at HBS, where most of the participants owned family companies. Tagiuri invited Davis to become his research assistant so they could both learn about family companies. It proved to be a very successful and enduring academic partnership that lasted over 30 years. Over the next four and a half years, while Davis finished his doctorate, the duo conducted numerous interviews with family company owner-managers and surveyed hundreds of executive students on various family business topics. They met almost daily to discuss their projects and findings in the lounge of Humphrey House, Tagiuri’s office building on the Harvard Business School campus. They would take over the lounge for hours, spread their papers over the conference table, and discuss the latest survey or interview results. There was almost nothing in the literature to guide their exploration. 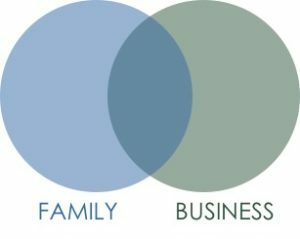 Little had been written about any aspect of family businesses, and the only conceptual model of a family business system was a two-circle framework, which showed the family and the business as two overlapping systems or circles. The Two-Circle Model recognized the influence of family and business on each other, and the need for alignment of family and business goals and interests. This model also made it easier to understand the confusion that individuals and the system could feel because of competing norms of the family and the business. But for Tagiuri and Davis, even in the early stages of their work together, the two circles fell short of capturing the interactions and tensions they were seeing in the family business systems they were studying, from a fledgling retail operation owned and run by its husband-and-wife founders to a late generation manufacturing empire owned by cousins with many non-family executives. So, they were on a hunt for a better framework. And it came several months after they began their research. Tagiuri thought for a moment. “Would this work?” he inquired, sketching out a third circle overlapping both of the first two, and labeling it Ownership. Case by case, the pair started to work through specific family business cases to see whether these systems could be adequately described by the three circles. Husband and wife co-founders, Father-son companies, sibling partners, large cousin families with multiple branches, family managers actively running the business, owners and spouses who were not running the business, family employees who had not yet inherited ownership, young children in the family, relatives who had been bought out but were still in the family, non-family employees who were given minority shares, and even the anonymous public owners of listed family companies—all of them not only fit within the Three-Circle Model, their perspectives, goals, and concerns were better understood by it. The addition of the third, ownership circle allowed more attention to be paid to other issues that were not explicitly recognized by the first two circles. Succession had to do with passing leadership and ownership. Some tough situations were resolved through buyouts of owners. Capitalizing a family business sometimes required bringing in outside owners. 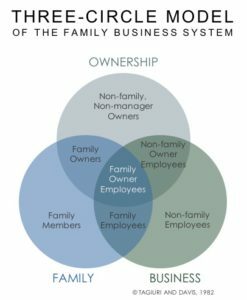 Linking the family, business, and ownership circles now fully defined the family business system, which is the integration of all three of these subsystems. Elementary it may seem, but for forty years now academics, business families and their advisors have been sketching these three circles to gain insight into the inner workings of their family business and business family relationships. All family business systems can be described using the three circles, and each family business system can be uniquely described with this framework. A family company is one whose ownership is controlled by a single family and where two or more family members significantly influence the direction and policies of the business, through their management positions, ownership rights, or family roles. This definition could not have been derived without a three-circle perspective. 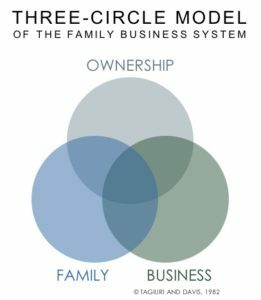 The Three-Circle Model of the Family Business System shows three interdependent and overlapping groups: family, ownership, and business. An individual in a family business system occupies one of the seven sectors that are formed by these three overlapping circles. 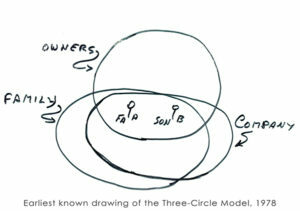 An owner (partner or shareholder) and only an owner will sit within the top circle. Family members will occupy the left-hand circle, and employees of the family company the right-hand circle. If you have only one of these roles, you will be in just one circle. However, if you have two roles, you will be in an overlapping sector, sitting within two circles at one time. If you are a family member who works in the business but has no ownership stake, you’re in the bottom-center sector. If you are a family member who works in the business and is an owner, then you will sit right in the center of the three overlapping circles. Each of the seven interest groups identified by the Model has its own viewpoints, goals, concerns, and dynamics. The Model reminds us that the views of each sector are legitimate and deserve to be respected. No one viewpoint is more legitimate than another but the different viewpoints must be integrated in order to set future direction for the family business system. The long-term success of family business systems depends on the functioning and mutual support of each of these groups. Sitting around the conference table in Humphrey House lounge on the Harvard Business School campus in the late 1970s, Davis and Tagiuri had no sense that they were inventing a game-changer. For starters, there wasn’t really a game to be changed: the study of family business was in its infancy. “There was not only little writing on these systems, there was almost no conceptual thinking on these systems.” Davis explains. From those doodles, though, came a model that allowed for deep analysis of family businesses, and led to benefits that are both direct and wide-ranging. Here are six often-noted impacts and consequences of the use of the Three-Circle Model. The model of the family business system shows three overlapping circles or subsystems that are interconnected, which indicates that what happens in one circle influences the others. If one circle, say the family, is in conflict or stuck, it can pull down the performance of the other circles and stall out the development of the entire family business system. On the other hand, a high-performing business can create pride in a family and build unity in the ownership group. More than just indicating interdependence, the three-circles visually raise questions that beg for answers. The Three-Circle Model not only helps identify where in the family business system issues are occurring, but also helps to diagnose why issues have occurred or spread from one circle to another. Why are two owners so opposed to one another? To what extent has their estrangement stemmed from family difficulties, or differences that evolved in their business relationship? Would an ownership agreement help? The Three-Circle Model explicitly recognizes the several interest groups or constituencies in the family business system. It becomes apparent that every group in the system has its own, legitimate interest in the family business, and all groups need to be respected, responded to and integrated in some way into the policies and decisions of the company. The Model also teaches us that the needs of the three circles, and of each interest group, evolve and change. The three circles are always in motion—never static. Families not only need to address their current challenges, but prepare for future challenges that they will likely face. Fortunately, the development of each circle over generations is fairly predictable. This realization led to the development of the Three-Stage Model of Family Business System Development (described in the book Generation to Generation: Life Cycles of the Family Business). “A decade ago, we were in the midst of many challenges. Our values had become confused with our rules. Treating people with respect meant not firing anybody. Consensus meant that the scope for leadership was limited. Eventually these, and other issues, caused serious problems in the business. We had a governance crisis and a performance crisis, and closed one of our primary geographic regions’ operations. When so much in business, technology, wealth, family, and society has changed, how can a 40-year-old model still help us understand and manage issues in current family business systems? Part of the reason why the Model has withstood the test of time, and is still relevant today, is that the Model, in its unaltered form, is adaptable. As the definition of “family” has changed in society, the Model allows for that. In-laws, blended families, divorce, adoption, domestic partners, and whoever the family calls a member of the “business family” because they are connected through ownership – all of these roles are consistent with the Model. Likewise, the ownership circle can accommodate many possible scenarios. If a family business goes public or invites a private equity partner, the Model accommodates that ownership change. If the company issues different classes of stock (voting and non-voting), and holds some of the shares in a trust, the Model accommodates that. Today, as families have many different capital alternatives, the Model accommodates joint ventures, mergers, acquisitions, and different sources of capital that impact the ownership circle. Many businesses have changed significantly in 40 years but the business circle of the Model is flexible: It may represent one business, or multiple businesses, holding companies, joint ventures and more. It can even describe a situation where the business family has sold its operating company and is managing their financial assets as an entity. The family is in a different business, but it is still their business. Similarly, the “business” circle can be labeled the “family office,” and the model still works. With the pace of change, globalization, technological advancements, and disruption around the world, the changing environment will continue to shape businesses, ownership groups, and families. And the Three-Circle Model will continue to accommodate this evolution. How About a Fourth Circle? Like designing a three-wheeled car or adding a second story to an Eichler house, sometimes a classic design stays around because it simply can’t be improved on—given its purpose. So what lies in the future for the Three-Circle Model? Will we be using these same three circles in another forty years’ time?